The first Jolla smartphone is finally official and it's simply called Jolla. The device is running the company's Meego-based Sailfish OS, which is now officially confirmed to support Android apps. At this point not much of the Jolla's specs are revealed. The phone packs a 4.5" display at the front and 8MP snapper at the back. There is 16GB of built-in storage, and you can expand that further via the on-board microSD card slot. The battery is user replaceable thanks to the Jolla's special chassis design, which allows for half of the phone to snap out of the other half and thus giving access to the battery. Available in a set of colors - light blue, green, white and orange - users will be able to interchange their back covers. 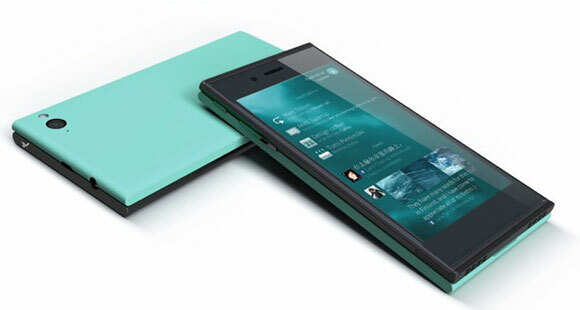 Then, Jolla's Sailfish OS will recognize which color is on and will adapt the theme of the UI to the color. Check out some official snaps of the Jolla. Here's co-founder of the company Marc Dillon with the first hands-on video (sort of) of the Jolla phone. In it, he urges developers, fashion designers, bloggers and users alike to join the Jolla tribe. Thank you Jolla. I pre-ordered. Now hurry up... take my money and bring it to me!! !